Do you ever find yourself glancing at interesting links as you scroll through your social media accounts & news feeds during the week, only to find you can’t keep up with them all? I know I do. Every week, I find myself saving a long list of links to read later. There is a lot happening in the food-nutrition-tech world, and I just can’t get to them all during my Monday-Friday, 8-5, so I typically read some and save the rest to read Saturday morning as I sip my coffee. It’s the perfect way to begin a relaxing & refreshing weekend – and there are so many things I’d love to start a conversation about. So beginning today, I’ll be sharing the best of digital news on the blog – with you! Yup! Every Friday, just in time for the weekend, I will bring you my short list of top reads from the past week covering food, nutrition, and food tech, and definitely some fun surprises thrown in there too. If there’s something that catches your eye, makes you smile or makes you grumpy – let me know in the comments! I’d love to hear what you think. Settle into your favorite reading spot and enjoy! Is fat good or bad; and what the deal is with sugar? The Guardian’s Ian Leslie weighs in on The Sugar Conspiracy. (It’s even more complicated and fascinating than you think). Eco Watch‘s newest list is out: Top Fruits and Veggies that you should always buy organic. Looking for clear, glowing skin? It’s all in what you eat. Dr. Sara Gottfried shares her tips for great skin. This article about skim milk labels got me thinking: what’s real and what’s natural when it comes to milk? Big Food labels GMOs; but, as Marion Nestle reminds: No amount of labeling makes processed food good for you. And then things get crazy in Japan with food tech: a new fork could help bland food seem salty. Say what? Wondering what to eat this weekend? Try these delicious Spring recipes. Cilantro Parsley Avocado Dip will make any party better. What’s better than pizza on the weekend? Seriously Simple Pizza Sauce makes it easy. Especially if you keep it healthy and use whole wheat tortillas as the base, spread a little sauce over the surface, and let everyone add their favorite toppings. You can do it tonight – very little advanced planning required. You’re welcome. Wake up on the right side of life tomorrow morning with this All Green Smoothie. 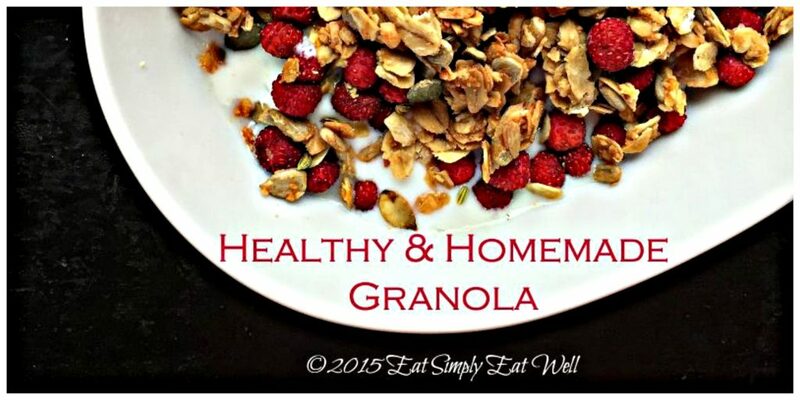 Or start prepping for mornings all next week with this Healthy & Homemade Granola – a favorite on this blog. Let them eat cake! 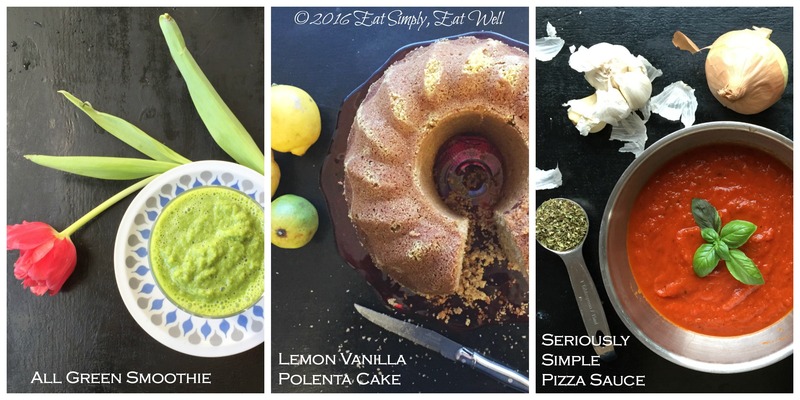 My Lemon Vanilla Polenta Cake is light, healthy, and has half the sugar of most polenta cakes. Grab some lemons and enjoy this cake all weekend. Busy, active weekend ahead? 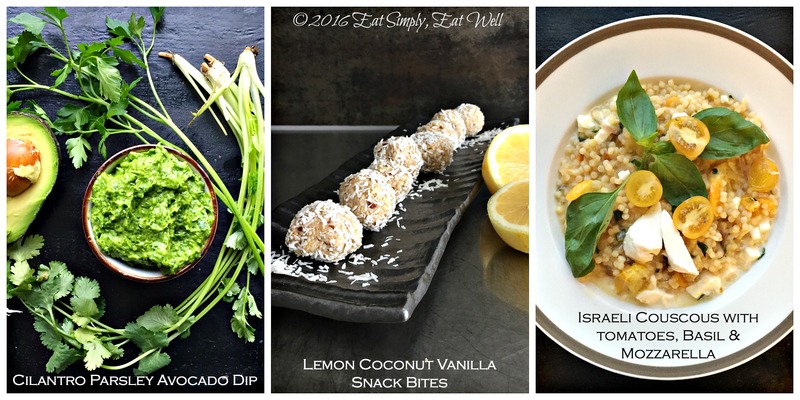 These Lemon Vanilla Coconut Snack Bites are the key to keep you happy & energized. This super-quick Israeli Couscous with Tomatoes, Basil and Mozzarella will make nearly everybody happy. Sub in regular couscous if you can find Israeli couscous. Enjoy the weekend, wherever you and however you spend it. Have you signed up for the ESEW newsletter yet? Go get yours by filling out the form at the top right of this page. Did you like this post? Let me know in the comments below, and share it with your friends on social media! Great post..I can totally relate 🙂 Getting through all the latest news,recipes and helpful tips is a full time job! Thank you for summerizing it all for us!